. 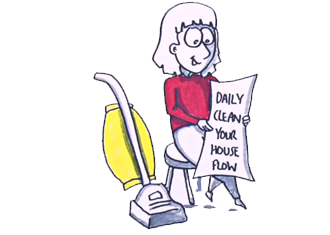 : Daily Clean Your House Flow - Deborah Myers Wellness :. The Daily Clean Your House Flow is a subtle and gentle form of wellness care that is based on the principles of Easy Self-Help Acupressure. Simply placing the fingertips on designated points can harmonize and restore energy flow. Holding these specific points in combination releases accumulated tension and resets the body to its natural balance. When there is balance and harmony, the body is brought back to its full potential. Our bodies are comprised of rivers of energy. Stress, anxiety, tension, injury and lifestyle issues can cause blockages that dam up the flow of energy and clutter your “house.” Acupressure is a valuable tool we can use to clear out tightness, achiness, distress and fatigue. deal with the shock of trauma (physical, mental or emotional). We can use it to strengthen the immune system and keep us well, and it can even help temper our emotions. So, to help let go of physical or emotional symptoms and to help prevent the onset of symptoms, do your daily energy work! You will notice how much better you and everyone in your life feels—and how much easier it is to deal with stressful situations!